Along with the ‘Cherry Bakewell‘ Balm, I received a sample sized tin of Bamboo Beard Co ‘Jelly Bean’ Beard Balm. Now I have to admit that I don’t actually know what Jelly Beans smell like. I have only ever eaten two, one was Popcorn flavoured which really was just butter flavour and the other was one of those unpleasant ones that left a bad taste in my mouth for ages and my daughter in fits of laughter! The Bamboo Beard Co ‘Jelly Bean’ Beard Balm has a sweet confectionary scent, my wife informs me that it does smell like Jelly Beans. This has brought up the question, has she been secretly eating some? I like a sweet scent in beard care and this is very well done, it has been blended so that it isn’t too sweet or overpowering. The scent has a nice strength and this is still noticeable on the beard for quite some time, but for me the Cherry Bakewell was my favourite. The base for this scent is Beeswax, Shea & Cocoa Butter, Coconut oil, Grapeseed oil, Jojoba oil, Wheatgerm oil and Benzoin. Benzoin is a resinous oil has a great calming and uplifting effect on the mind and helps to comfort, while boosting circulation and easing respiratory disorders. At the same time it boosts the skin’s elasticity, while calming redness, itchiness and irritation. Benzoin resin has a sweet, warm and vanilla-like aroma and is golden brown in colour, with a treacle-like viscosity when not dilute. 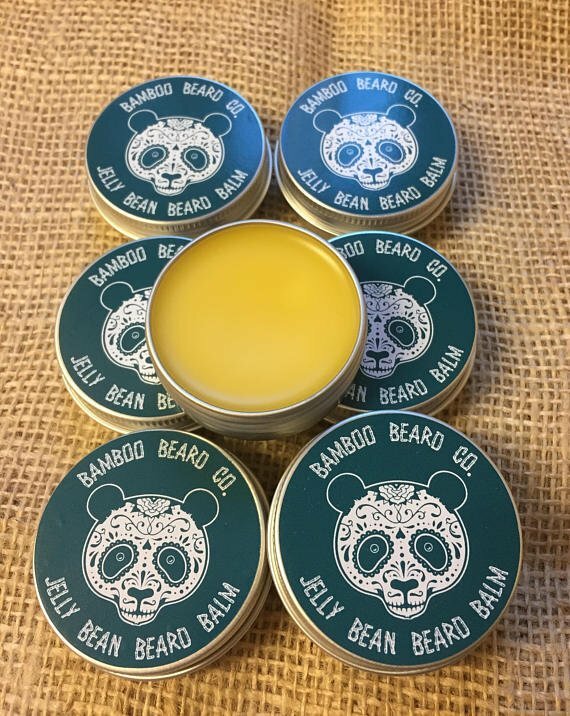 Just like the ‘Cherry Bakewell‘ Balm the Bamboo Beard Co ‘Jelly Bean’ Beard Balm manages to soften the beard, give it a slight hold and you don’t need to use a lot to get these results. I prefer balm over oil, it keeps my beard softer, gives it hold and I would use balm all the time if I wasn’t testing products. You can keep up to date with Bamboo Beard Co on Facebook and Twitter.